When creating your character in Sunless Sea, you are asked how you would like to be addressed. Many of your options aren't gendered—with selections like 'citizen' and 'captain' offered freely among alternatives like 'lady' and 'lord'. By focusing on address and pronouns rather than gender in character creation, representation of nonbinary genders is seamlessly implemented in this title. 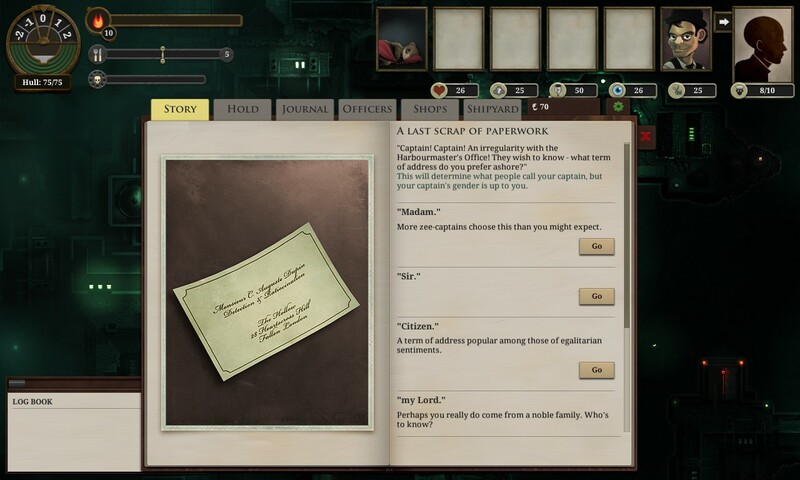 In the Queer Representation (2016) survey, several respondents, including those self-identifying their gender as nonbinary or genderfluid, specified that Sunless Sea features their favourite representation of gender and/or use of pronouns within a game. Sunless Skies also features nonbinary player-character options, as well as several trans and nonbinary characters. This game is still in-development.